It takes an hourly wage of $22.10 to afford the median two-bedroom apartment versus the actual median wage of $16.88. That makes it 31% out of reach. And the median cost for a two-bedroom apartment three-times minimum wage. The most expensive state is Hawaii at $36.16 compared to the $16.16 actual hourly wage earned, making it 123% out of reach. Meanwhile, the lowest is Arkansas at $13.84 needed, and an actual hourly wage earned of $13.05. That is only 6% out of reach. Then there’s Puerto Rico at only $9.24 an hour to afford that median two-bedroom versus $9.76 of actual wages. Finally, an affordable place to live as a U.S. citizen. The next two tables summarize a recent survey that ranked cities by the percentage of households that are cost-burdened by renting or owning houses. This means that they spend over 30% of their income on housing. 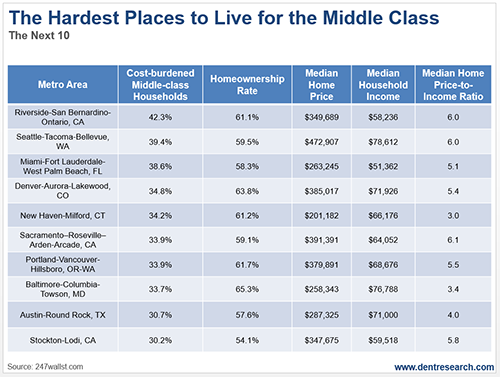 They also have some good information on incomes and housing affordability. The top five for cost burdens are San Francisco (55.9%), San Jose (54.7%), Oxnard/Thousand Oaks/Ventura (53.5%), San Diego (52.2%), and Honolulu (51.9%). Four of these are in California – no surprise. And Hawaii has always been expensive. The lowest out of these are Stockton (30.2%), Austin (30.7%), Baltimore (33.7%), Portland (33.9%), New Haven (34.2%), and Denver (34.8%). It jumps to 39%-plus from there. Austin and Denver are rated high for attractiveness as well. 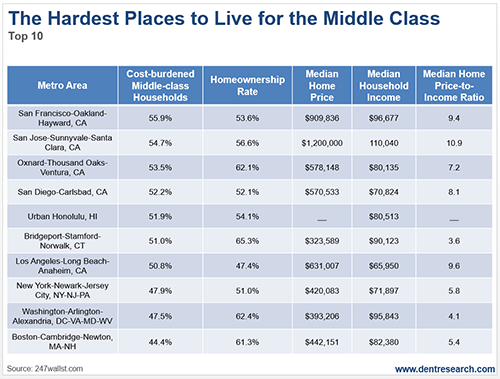 Housing for ownership is least affordable in San Jose at 10.9-times median income. Los Angeles comes in at 9.6, with San Francisco at 9.4, and San Diego at 8.1. Honolulu is not quoted here on home prices, but other surveys put its price-to-income ratio at near 10 times, similar to San Francisco. Conversely, the lowest home ownership rate is in Los Angeles at 47.4%, with both high prices and lower incomes. Both of these high-cost rental cities have the lethal combination of expensive housing costs and modest median incomes. New York is at 51.0%, with San Diego (52.1%), San Francisco (53.0%), and Honolulu (54.1%) all in the same range. The most affordable price-to-income ratios for home ownership are in New Haven, Connecticut, at a fair 3 times as much, Baltimore at 3.4, and surprisingly, Bridgeport/Stamford at 3.6 times. A painful housing correction is due to hit. And it’s precisely the medicine the economy needs to allow the ‘American Dream’ to stay alive for the up-and-coming Millennial generation. It’s us – the older Baby Boomers – that will feel the brunt of things if we don’t get out of the way.